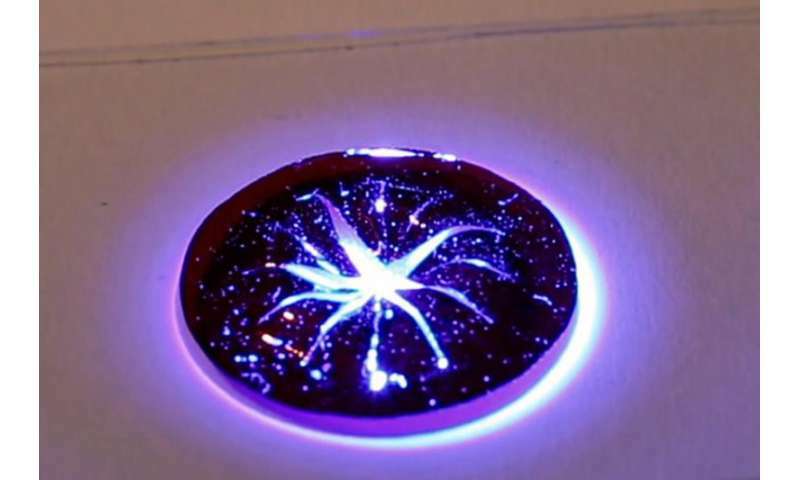 An artificial iris manufactured from intelligent, light-controlled polymer material can react to incoming light in the same ways as the human eye. The iris was developed by the Smart Photonic Materials research group from the TUT, and it was recently published in the Advanced Materials journal. The iris in the human eye is a tissue that regulates the amount of light coming into the eye by changing the size of the pupil. This way, the retina always receives the correct amount of light, ensuring a high-quality vision event. Controlling the amount of incoming light is just as important to imaging applications, such as cameras. However, these applications require complicated control circuitry and light detection schemes to adjust the amount of incoming light and produce high-quality pictures. The Smart Photonic Materials research group from the Tampere University of Technology (TUT) has developed a solution for this problem: an artificial iris that acts like the human eye. "An autonomous iris that can independently adjust its shape and the size of its aperture in response to the amount of incoming light is a new innovation in the field of light-deformable materials," says head of the research group, Academy Researcher, Associate Professor (tenure track) Arri Priimägi from TUT's Laboratory of Chemistry and Bioengineering. TUT's researchers developed the iris in collaboration with Dr Piotr Wasylczyk from the University of Warsaw and Dr Radosław Kaczmarek from Wrocław Medical University. The artificial iris was manufactured from light-sensitive liquid crystal elastomer. Its manufacture utilised the so-called photoalignment technology that is also used in some contemporary mobile phone displays. "The artificial iris looks a little bit like a contact lens, and its centre opens and closes according to the amount of light that hits it," Priimägi says. According to Priimägi, what makes this invention significant is the device's ability to function autonomously, free from power sources or external light detection systems. "This research was inspired by Dr Kaczmarek, who is an ophthalmologist and foresees potential use for a self-regulating iris-like device in the treatment of iris defects. The road to practical applications is long, but our next goal is to make the iris function also in aqueous environment. Another important goal will be to increase the sensitivity of the device in order to make it react to smaller changes in the amount of incoming light. These developments will be the next steps towards possible biomedical applications," Priimägi says. As the head of the research group, Priimägi expresses his thanks to group members Postdoctoral Researcher Hao Zeng and Doctoral Student Owies Wani for their important contributions to the success of the artificial iris research. The project is also anticipated to launch a long-term collaboration with Dr Wasylczyk on soft robotics and light-actuable materials. Earlier this spring, the Smart Photonic Materials group published a paper in the Nature Communications journal concerning a light-driven polymer gripper, resembling in function the Venus flytrap plant, that can independently recognise different objects and select the desired ones among them. The research opens new venues in the development of soft micro-robots.